The Vatican Church, dedicated in honour of St. Peter, is the second patriarchal church at Rome, and in it reposes one half of the precious remains of the bodies of SS. Peter and Paul. The tombs of the great conquerors and lords of the world have been long since destroyed and forgotten; but those of the martyrs are glorious by the veneration which the faithful pay to their memory. The body of St. Peter is said to have been buried immediately after his martyrdom, upon this spot, on the Vatican hill, which was then without the walls and near the suburb inhabited by the Jews. The remains of this apostle were removed hence into the cemetery of Calixtus, but brought back to the Vatican. 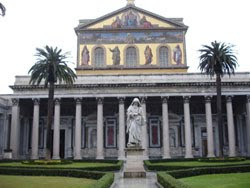 Those of St. Paul were deposited on the Ostian Way, where his church now stands. The tombs of the two princes of the apostles, from the beginning, were visited by Christians with extraordinary devotion above those of other martyrs. Caius, the learned and eloquent priest of Rome, in 210, in his dialogue with Proclus the Montanist, speaks thus of them: "I can show you the trophies of the apostles. For, whether you go to the Vatican hill, or to the Ostian road, you will meet with the monuments of them who by their preaching and miracles founded this church."